Genius comes in many forms . . . loud and brash demanding attention and tainted with narcissistic hubris; or understated and gentle, so quiet it goes unnoticed in a world where a cacophony of stimuli vies for our attention. Charles Covington, Jr. is a distinguished exemplar of the latter. At seventy-seven, this gentle man is disarmingly brilliant and still capable of rendering virtuosic performances on either the piano or the Hammond B-3 organ. Following a stint in the army, Covington returned to Baltimore, determined to learn music and play jazz. He enrolled at the Peabody Conservatory of Music, taking the only class offered in jazz. Ironically, he was not allowed to attend classes. He took his instruction at the home of his teacher because people of color were not welcomed at Peabody at that time. Undaunted, Covington taught himself piano and organ at the Hammond Music School in Baltimore, spending $.50 an hour to learn in their practice rooms. According to Covington, his real music education came as a result of his haunting the clubs on the famed Baltimore Street in downtown Baltimore. Once the home of night clubs and strip clubs, Baltimore Street provided Covington with an opportunity to hear a myriad of musicians and musical styles. While his skills were still in their infancy, he apprenticed himself to a local singer named Peaches who took a liking to him and took him under her wing. As Covington explained, Peaches exposed the young neophyte, who never drank or smoked, to Baltimore’s club world. His challenge was to learn and play from her personal songbook. Under Peaches mentorship, Covington got to know all the musicians “on the block,” memorizing twelve to fifteen songs daily so he could play anything. Experiencing disparate treatment from a musician’s union that favored whites, he and other musicians of color were required “not to stand out” during the breaks in the clubs where they played. As Covington’s fame grew, he studied Fats Waller, Ray Charles, Wild Bill Davis, and Jimmy Smith. He perfected his use of the sustain pedal on the B-3. Musicians spread the word about this young “cat” who could play anything. Earning “steady money” and developing a loyal following, Covington became an opening act at the Royal Theater in Baltimore. His “big break” came when a local drummer invited him to play in New York. In the audience was George Benson’s manager who, after hearing him play, invited him to tour and play with Benson. Ironically, while the money was good, there were times when things were slow and “tight” on the road. With a growing family in Baltimore, Covington took up chess. In an effort to make ends meet, he’d haunt the chess clubs in New York where he “hustled” chess. True to form, Covington obsessed with chess and became one of the top ten black chess players in America. He still enjoys “Life Master” status granted by the United States Chess Federation. 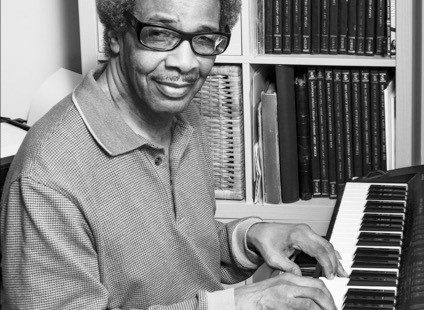 His renown and expertise as a jazz pianist and organist garnered the attention of none other than the Peabody Conservatory of Music who, after his early experience there, hired him to teach jazz piano. His tenure there lasted twenty years. He also added to his resume a twelve-year stint as a professor of piano at Howard University. As if music and chess mastery weren’t enough, Charles Covington is also a performing magician. He has authored texts on mathematics, chess, checkers. Having had a life in jazz, Covington counts among his many experiences concerts performed at The White House, Kennedy Center, Peabody Conservatory of Music, Baltimore Meyerhoff Symphony Hall, Baltimore Museum of Art, Montpelier Art Center, Eubie Blake Cultural Center and many international venues. He appeared on Johnny Carson’s Tonight Show and recorded the album The Shape of Things to Come. Among the many performers with whom he has recorded are: J.J. Johnson, Ethel Ennis, O’Donel Levy, Nathan Page and many other jazz artists. He was featured on the cover of Expo Magazine as Jazz Musician of the Year in 1983. As jazz pianist in residence at the Kennedy Center, Covington performs there annually. One need only search YouTube to see his stellar performances on the K.C. Millennium Stage with a host of notable musicians as well as his many concerts at Howard University. Charles Covington, pianist, organist, chess master, mathematician, magician . . . gentle genius. On Saturday, January 19th Charles Covington will perform from 7- 8:30 pm (dinner seating at 6 pm) at Germano’s Piattini, 300 South High Street, Baltimore, MD 21202. Purchase tickets ($20) in advance at germanospiattini.com or 410-752-4515. Note: Entertainment is for dining patrons only.